Shona and Steve at start of Walkway. We have been lucky to meet so many wonderful people on our journey, that have helped us on our way – many thanks to you all. 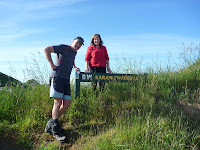 Shona and Bruce run the Karamu Valley Lodge and offer great support to Te Araroa walkers with their Travellers Rest. John at the Te Kauri Outdoor Pursuits Centre will pick walkers up after the Pirongia section at Gayne Road and whisk you back to the centre, very similar to the Forest Camp in Hanmer except that it also had 1400 hectares of bush reserve as well !! Thanks John and for going the extra mile! Monica and Maurice at the Art Coc Gallery and café in Bennydale have been awesome in helping us to change plans due to track closures, we wish them success with the Timber trail accommodation plans. The Timber trail is an exciting new 85k cycleway from Pureora to Ongarue, well worth a return trip. Finally Linda and Tracy at Te Punga on the Whanganui River who were the ultimate hosts when we shared our journey with Sally, Pete, Geoff and Janet who we had met earlier on the way through Kerikeri. We started our journey on the 13th Nov at the Blue Duck Station , Whakahoro – it was our 30th wedding anniversary and a great place to be for such a momentous occasion!! Lynne deserves a medal or is it the other way round? From Mangapouri Landing we got into our Canadian canoes and had a few lessons from Big Chief Sitting Bull Brodie on how to paddle and off we went down a few exciting rapids till the river calmed and passed though the most incredible gorges. Our trip became a great adventure staying at the Convent in Jerusalem, where we had to bash out an access point with our barrels, meeting Tracy and Linda at Te Punga and being treated to culinary delights, getting soaked in a storm and having lunch in the Marae, visiting the Flying Fox and walking and cycling the last section when the river rose and it was too dangerous to continue.We would thoroughly recommend the trip to anyone and especially with the help of the Te Punga girls. 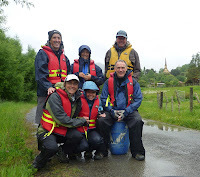 For the canoeists out there reading this the Wanganui River Journey from Taumaranui to Wanganui must be one of the best Grade1 / 2 trips you could do. We only did part of it. Lots of options with campsites, tremendous scenery, no cell phone coverage, lots of canoe hire companies. A basic understanding of moving water techniques would be useful. It has a huge catchment area and can rise dramatically. It’s definitely not for novices. A canoeing guide is available from I Centre in Wanganui. Treat it with respect. We had hoped to do the Tongariro crossing section next but the volcano erupted and put paid to that. So we have spent the last week in and around the area, we did the 42nd traverse on foot - better known as a mountain bike track, a stunning route through the Tongariro Forest Conservation Area. Also the Mangetepopo Hut to National Park via the Whakapapa Village and Chateau !! Then added in the new section of the Mountain to Sea Cycle track along the Fisher Track and back to Whakahoro. 1200k plus completed. We are now taking a break to have Xmas with the Brodie bunch who fly in from the UK all wearing their England rugby tops!!!! ps if you have a number for the accommodation in Feilding that would also be awesome as we couldn't see it in the notes.